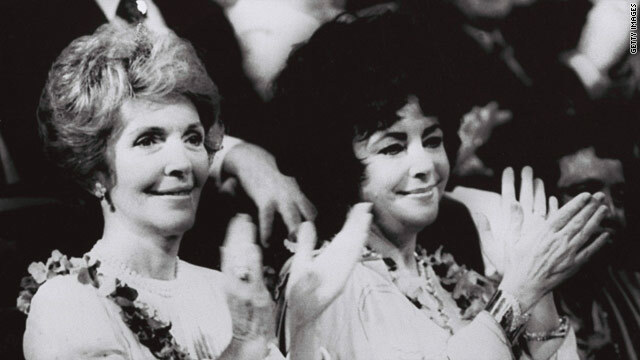 Elizabeth Taylor and Nancy Reagan applaud during the GOP convention held in July of 1980. (CNN) Hollywood star Elizabeth Taylor had a lesser-known side as political activist and politician's wife. Taylor, who died today at 79, married her sixth husband, former Republican Senator John Warner in 1976, and was an active figure during his 1978 campaign. The glamour Taylor brought to the campaign trail was said to have helped Warner gain the popularity that ultimately helped him win the seat as Virginia's senator. "She loved the state of Virginia, which I represented, because it reminded her of her British heritage," Warner told CNN. Taylor was born in London. For five years, Taylor played the role of Washington political wife until the couple's divorce in 1982. The two stayed close. "We were friends until the end," Warner told CNN. During the 1978 campaign, Warner finished second at the GOP convention to Richard Obenshain. Two months later, Obenshain died in a tragic plane crash, and Warner replaced him on the ballot before narrowly winning a general election against Democrat Andrew P. Miller. "She was my partner in what appeared to be an impossible challenge for the United States Senate. … Hand in hand we marched off with no campaign stamps, no funds were raised and we had but nine weeks to put together a campaign which we did and won it narrowly and that laid the foundation for a career," Warner told MSNBC. Warner retired from his senate seat in 2009, after a 30-year career as the second-longest serving senator in Virginia's history. Almost a decade later, Taylor was back in Washington, this time in connection to her AIDS and HIV support efforts. Warner hosted a Capitol Hill reception in 1986 for Taylor when she testified before Congress in a lobbying effort for greater AIDS research funding. Taylor went on to serve as the Founding International Chairman for the Americans Foundation for AIDS Research and helped raise more than $100 million for the cause. Taylor would often find herself back in Washington to receive various awards for her philanthropic work. In 2001, President Bill Clinton presented her a Presidential Citizens medal. In 2002, Taylor was granted the Kennedy Center Honors in the performing arts. Taylor was an avid Hillary Clinton supporter during the 2008 presidential race and donated the legal maximum of $4,600 to Clinton's campaign. "I have contributed to Sen. Hillary Clinton's presidential campaign because she has a mind of her own and a very strong one at that," Taylor said in 2007. "I like the way she thinks. She is very savvy and a smart leader with years of experience in government, diplomacy and politics." "With the passing of Elizabeth Taylor, America has lost one of its greatest talents and fiercest advocates for HIV/AIDS research…..We were honored to host her at the White House in 2001 when she received the Presidential Citizens Medal for her relentless crusade for more AIDS research and better care. In founding amfAR, she raised both millions of dollars and our level of awareness about the impact of AIDS in the United States and around the world," Hillary Clinton said in joint statement with President Clinton. Taylor later became a fan of President Obama. In 2009, Taylor announced that Obama inspired her $100,000 donation to the Alliance for Christian Education. "Our new president challenged us to break down barriers that divide us," she said of President Obama. House Minority Leader Nancy Pelosi paid respect to Taylor's philanthropic work in a tweet, "her work on HIV & AIDS, esp when others stayed silent, saved lives." Taylor died Wednesday of congestive heart failure in Los Angeles. She was a two-time Oscar winner who appeared in more than 50 films. "I will remember her as a women whose heart and soul were as beautiful as her classic face and majestic eyes," Warner said. Elizabeth u will b missed! I knew it would not be long for Elizabeth Taylor to make it to the Political Ticker...Liz R.I.P.!! What nice comments from Senator Warner. It is great that they stayed close. She put money where her mouth was, as this old saying goes.